Love Jalapeno Poppers? Try this Jalapeño Popper Grilled Cheese Sandwich with Beer Battered Crust; it’s like a jalapeño popper on steroids! 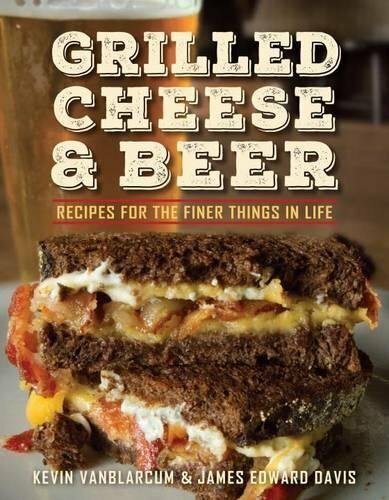 This recipe comes by way of a book I was asked to review; aptly named Grilled Cheese and Beer from Kevin VanBlarcum and James Edward Davis. 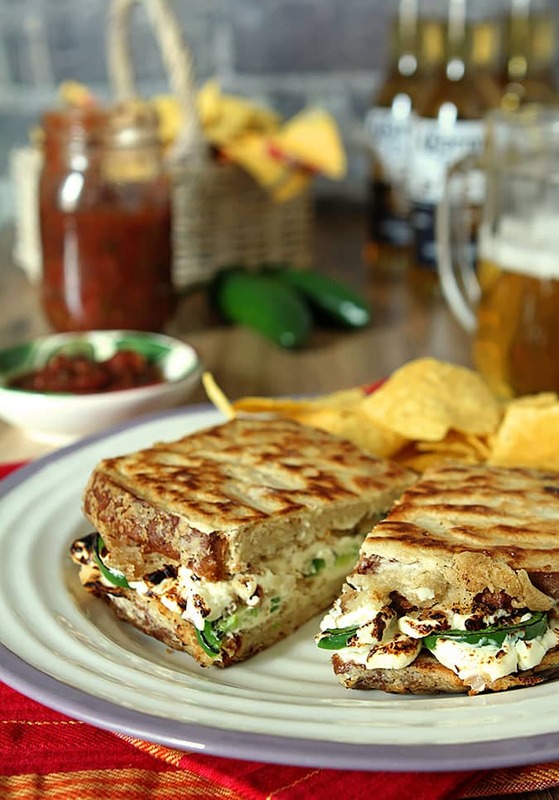 I agreed to take a peek for one reason and it wasn’t the beer; I just LOVE, LOVE, LOVE grilled cheese sandwiches and this book has that in spades; fifty recipes to be exact. I thought the suggestions for a beer to accompany each sandwich an interesting concept and one I know will appear to many beer enthusiasts…especially those who love sourcing a great craft beer. I perused the book for a bit and decided to make the Jalapeño Popper Grilled Cheese Sandwich with Beer Battered Crust. There is nothing quite like the jalapeño to illustrate how our tastes can change dramatically. When first arriving in Denver more than 25 years ago, I would pick those spicy peppers off of anything that included them. Today I love that burst of heat and I know from making this Bacon, Jalapeño and Cream Cheese Pizza just how much I love them when combined with the smooth silkiness and mellow flavor of creamed cheese. The authors selected my state’s Coors Beer to accompany this sandwich which was cool except for one thing. I’m not a big beer drinker but try to keep some on hand for friends. With Corona in the pantry, I figured ‘close enough.’ Hey there are jalapeño and it is Mexican Beer! Some might say that grilled cheese is the most perfect food in the world. There are days I agree; it’s easy and quick and yet that combination of melted cheese and crisp, buttery, toasted bread can be like Heaven on a plate. I’ve had many times when the last thing I want to do at the end of a day in the kitchen and studio is to prepare more food and a grilled cheese sandwich can be the best solution for a quick satisfying meal. This combination? It hit perfectly in so many ways. The crisp beer battered crust combined with warm, silky cream cheese that was the perfect accompaniment to the heat and firm bite of the jalapeños. I don’t think I could have tried another recipe in the book I would have enjoyed more for my trial run. I keep my grilled cheese sandwiches pretty simple; maybe too simple. Kevin and James have brought together myriad suggestions with readily available ingredients and I can’t wait to try more. Next on my agenda will have to be something with Brie. I like the unusual pairings far more than the expected American or Cheddar cheese. Suggesting the perfect beer is an added bonus! This sandwich paired perfectly with the homemade salsa that my neighbor Amy and I canned last year. I hope I remember what we did…I really need to post that recipe. She normally makes it fresh but it was end of the season tomato time and we had to use up some of our bounty. 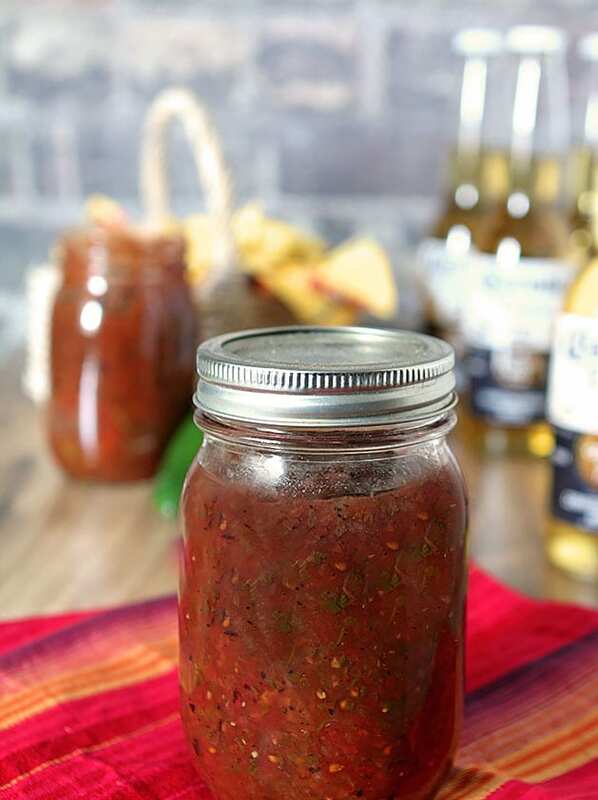 Now we need to plan that…I want more of this salsa! I served it on the side for chips and for dipping; so yum! After I finished this recipe I took a gander at Google and found several similar recipes. One big difference? None of them made a beer batter for the bread and grilled it before pulling the sandwich together. That was huge…the batter added a level of flavor that was unmistakable and now any version without it would be deemed as boring. 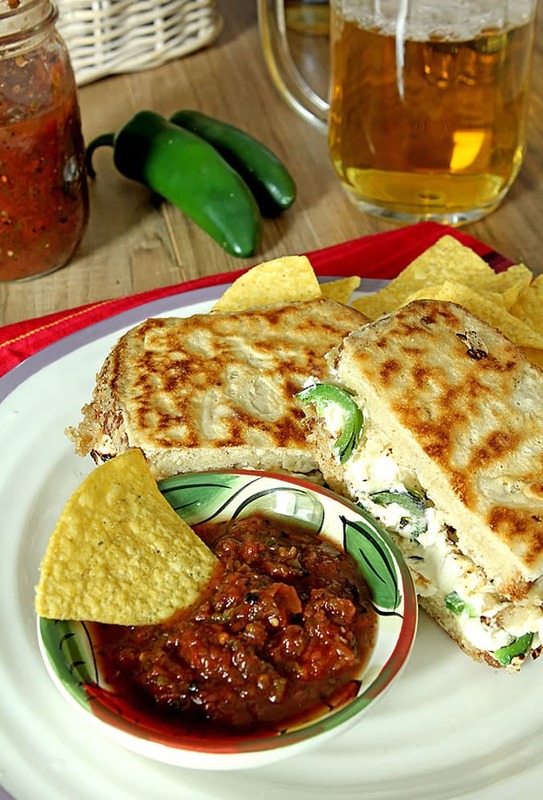 Beer batter, cream cheese, jalapeno and homemade salsa. Cried when I took my last bite. Grilled Cheese & Beer combines an extensive knowledge of beer making, food, and good humor and the authors will delight fans everywhere. Kevin VanBlarcum is a brewer at Keegan Ales in Kingston, NY. After graduating from the University at Albany, he began pursuing a career in the brewing industry. Born and raised in the Catskill Mountains, Kevin currently resides in Pine Hill, New York. James Edward “Eddie” Davis has honed his skills as a chef from Brooklyn, NY to the Catskills. Eddie fell in love with the culinary arts and began to hone his skills at a local favorite, The Caboose. It’s a fun book and if you’re a craft beer lover? Doubly so! 1 bottle (12 oz) beer. I used Corona but any regular wheat beer will work. Combine the flour, baking powder and salt and whisk to combine. Add enough beer to make the batter thin enough to dip the bread in...I used about 3/4 of a bottle so start with a half bottle and continue to add until the desired consistency. Dip each bread slice into the batter, covering both sides. Fry in a medium hot frying pan with enough butter in the bottom to not have it stick to the pan. Spread the cream cheese on both sides of the bread; top one side with japapeno slices and warm until the cheese is softened and warm. Put the two sides together, cut in half and serve. There is enough beer batter for approximately 4 sandwiches. Wow, this sounds just awesome! Stumbled on your site today on Pinterest, I have subscribed! Awesome recipes! Thank you! Thank you Janice…and glad to have a new reader! Really creative idea! Who doesn’t love jalapenos? Well, probably lots of people, but I’m not among them! Can’t get enough. And they combine so well with cheese. Perfect sandwich — thanks.